an in order to get your project finished. With the latest trends, people are just not contented or satisfied with stylish, comfortable furniture in their homes but also want to beautify their backyards, patio, and porch also. They add garden furniture and accessories or add patio covers or deck railing with designs that highlight the structure of their house and add value to their property. Nowadays, decks are not just constructed as rectangles positioned at the back door of a house. But more and more people are spending a lot more time and using their imaginations and learning how to build a deck that is unique and makes a beautiful addition. In case if you are planning to construct a deck on your own then you can go online and get many ideas on ‘how to build a deck’. But this may give rise to confusion so follow these handy tips and make your decking project a successful one and take the frustration out of your deck building process. Guidelines and decking tips you need to know on - How to build a deck. 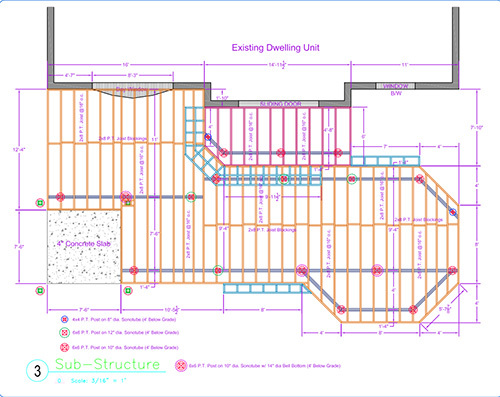 First and foremost select or get a blue print of the deck plan which suits your requirements and fits the space. Consider these factors along with your decking plan. • Purpose: Find out the main purpose and utility of your deck. Are you looking for an extra space to entertain your guests on regular basis? If yes, then make a mental count of how many guests you want your deck to hold. Moreover you will need additional furniture, railings, lighting and extra space for children to play and move about. So first decide on your purpose, and think of all the issues related to it while planning to build a deck. • Location: Location is the prime factor. Your deck must not affect your landscape. You may even need to remove trees if it demands, and you have to consider the entrances and exits to your home as well. Remember that you should have an easy access to your deck and so it should be in a right place. • Supports: Find out the number of supports you will need. Calculate the number of footings and posts you will require and at what distance you will place them. The larger the deck, the more footing and supports you will need and vice versa. • Material: For deck building, you will require material and so select material that is right for you. Do you want to build a deck of wood or composite materials? If you are keen on wood, then select from various varieties like redwood, cedar, or timber. Always prefer treated wood because it is weather resistant and does not rot or decay. 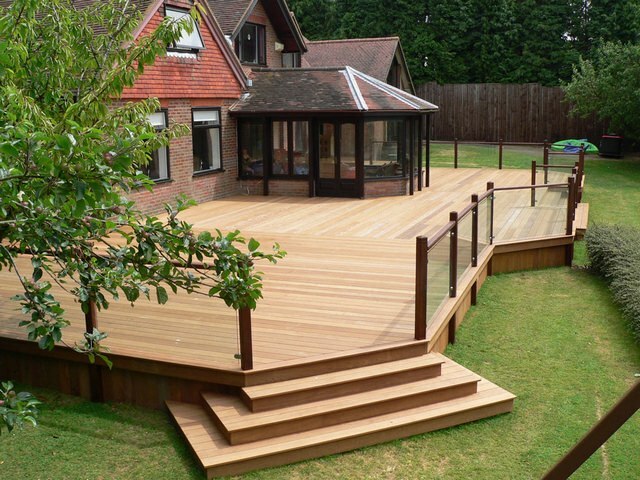 If you choose ordinary decking material, then you will need to sealant material. Composite decking materials are being commonly used these days and are considered a better option as they are chemically engineered and thus you get rid of all the problems with traditional wood deck. • Drainage: Check drainage and see you are not disturbing the underground pipelines. This point is often ignored by amateurs who are learning how to build a deck. as and tips available on ‘How to build a deck’. Multiple options on size, shape, and style can be utilized to construct a deck. • Permit: When learning how to build a deck, you must first go to the local government authorities and know the rules, check the policies, zoning laws and get an official permission. • Height: Your deck height must not exceed. It must be in accordance with the plan. • Positioning: The next step you need to know about how to build a deck is positioning of deck railings. This depends on your layout but it must also complement with your modern or contemporary house. How to build a deck that adds value to your house requires minute detailing. You must make a list of all tools that you will need, measure the exact material you will require and in addition all the decorative materials like railings and lightings you will require. • Do-it-yourself is a better idea if you are on a shoe-string budget. You can get ideas and step by step instruction and learn easiest and simple method on how to build a deck on internet. In brief a well constructed deck adds additional space which you can utilize for studying or partying. It can serve as an extension with the interior space becoming an outdoor space and you can enjoy all the benefits of a classic deck if only you have mastered the skill of – How to build a deck.